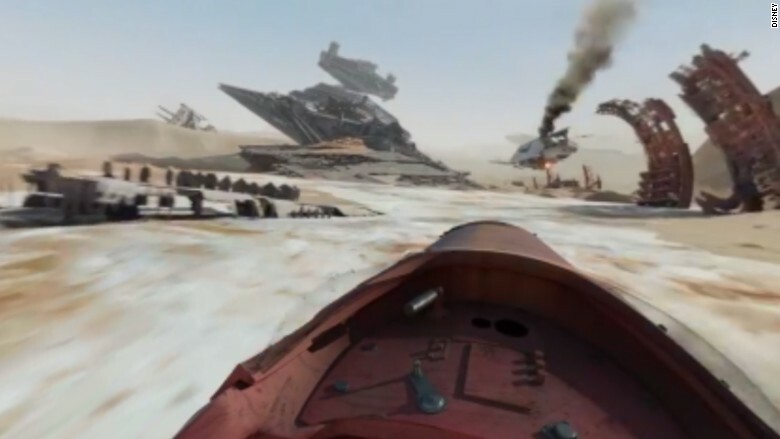 This is a still image from a 360-degree, interactive Star Wars video by Disney. On Wednesday, Facebook introduced 360-degree videos to its newsfeed platform, letting users experience video by looking around in every direction. The first batch of "360 videos" were published Wednesday as marketing material from the makers of Star Wars, NBC's Saturday Night Live, Go Pro and others. The Star Wars video lets you look around the desolate, war-torn wasteland of a far-off planet. The Saturday Night Live video has you join the live audience during its 40th anniversary show. Meanwhile, GoPro brings you along for a dirt bike joy ride in the Idaho desert. How does it work? At a desktop computer, use your mouse to "grab" the screen and pan in any direction. On a smartphone, you're supposed to tilt the device to look around. But right now, this feature works best on a desktop computer. If you try it on a smartphone, you'll probably get this message: "360 Video is not yet available for this device." Facebook (FB) says 360 Video works on Android, but it didn't work during a quick test by CNNMoney. Facebook said it expects to roll out this feature to iOS in the coming months. It's a radical new way to experience media. And it shows we're one major step closer to virtual reality becoming an everyday affair. But keep in mind, that takes special 360-degree cameras, which easily cost $400 or more. Facebook isn't the first to experiment with this type of media. YouTube started supporting 360-degree videos in March. Facebook is betting big that virtual reality is the future. It bought VR headset maker Oculus for $2 billion last year, but this is the first time its foray into virtual reality touches consumers. Another major takeaway here is that two worlds of media -- photographic video and videogames -- are merging. Videos are traditionally one-way conversations. You sit back and watch a screen. Video games are, by definition, interactive play. The introduction of 360-degree videos is all about increasing user interaction.